Frida Kahlo painted her Self-Portrait with Thorn Necklace and Hummingbird in 1940 – the year of her divorce from husband Diego Rivera. The artist depicts herself in a Christ-like way as an icon of suffering. The thorny jewellery, which drills into her neck, is the expression of her pain and stoic life. It is reminiscent of her severe accident and the difficult relationship with Diego Rivera. Attached to the thorny necklace is a hummingbird – a bringer of good luck according to Mexican folk tradition. A cat and monkey sit behind the artist’s shoulders in a backdrop of foliage. The monkey, a gift from her husband and symbol for sinfulness, as well as for the devil himself, plays thoughtfully with a thorn. The cat stands for bad luck and death. It gazes mistrustfully upon the hummingbird. 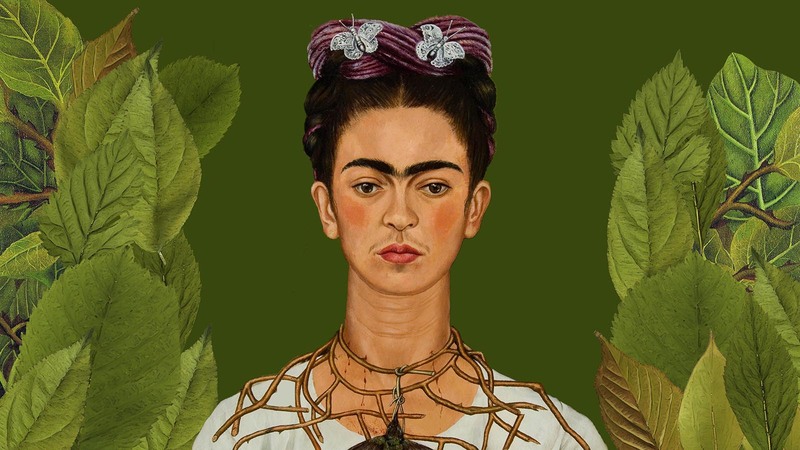 Butterflies, the symbols of resurrection, float around Kahlo’s head. While the monkey, cat and thorns represent the suffering of Kahlo, the leaves of their garden stand for protection and security. The process of animating the painting takes its strong symbolism into account. The leaves are redrawn using photographic templates and each leaf is saved as an individual image layer in Photoshop. This allows the image format to be extended to 16:9. 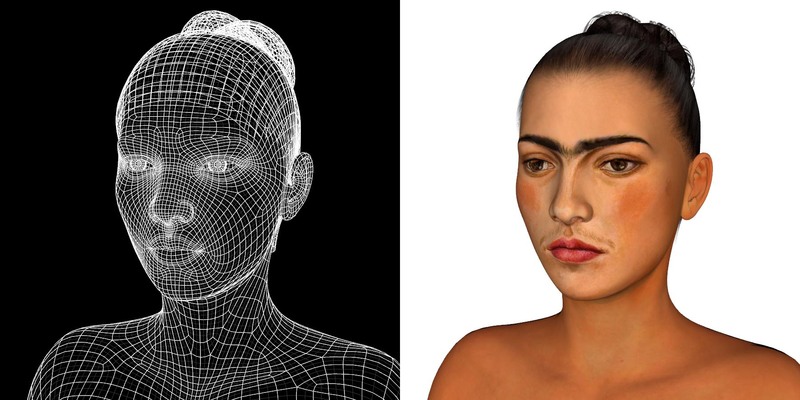 Kahlo’s head is modelled in Facegen Artist and processed further in Daz Studio. Both the front-view portrait and a photo from Gettyimages depicting a profile shot of the artist are used as templates. The photo is coloured in Photoshop before it can be used as a profile template for modelling in Facegen. The remaining parts of the image are masked in Photoshop and arranged in layers. 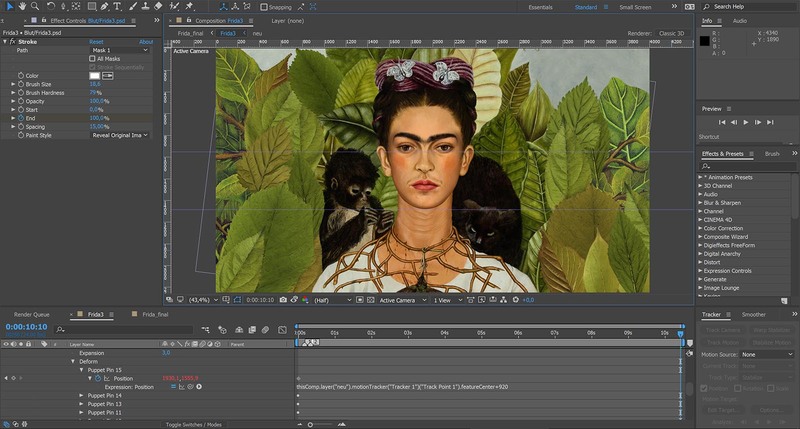 The layer sets used for the leafy background, Frida Kahlo, the butterflies, cat and monkey are imported into After Effects as separate compositions and then animated using the puppet tool. The movement of the 3D head is then recorded using camera-tracking and linked using Expressions with the puppet points on the neck. The flowing blood is animated with a mask and the brush stroke function, while the butterfly is moved as a sub-composition on a path. Souter, Gerry: Frida Kahlo: Beneath the Mirror. New York 2005.